Whenever I think of chestnuts the first image that pops into my mind is a street vendor in Rome selling fresh roasted marroni (chestnuts) in little brown bags. The smell of a wood fire wafts into my nostrils, and my heart fills with longing to walk the streets of Roma on a cold December night with my wife, and stroll from piazza to piazza experiencing the wide variety of stalls filled with a myriad of items for Natale. Next I am transported to a small woods in Cerro, a tiny town above Verona at the foot of the mountains. Our family is walking with Severina, our Italian mother, and she is instructing us on how to find and pick up chestnuts. She turns the leaves over with her cane uncovering more and more of the prickly cases that encase the nut. We stuff our bags full, and head to her apartment to roast some, and get warm. It may not be quite as romantic, but John Freeberg, Michael Havelka, and a few other folks joined me at Green Building Supply on Tuesday, December 13 for our own local chestnut festival. John turned out a quite delicious apple/chestnut soup. Also, he made a chestnut hummus, a chocolate cake with chestnuts, and the live audience enjoyed a triple cream cow's milk cheese (Trillium from Fox River Dairy)with a honeycrisp apple, and hot spiced apple juice. Michael Havelka talked about the chestnut, its history in the States and Iowa, growing chestnuts for profit, and John chimed in about preparing them in numerous ways. We also tackled such lofty topics as the future of agriculture with Avi Pogel, Dr. Thimm, Chef Eric, and one or two other folks contributing to the lively discussion. Next month join me and Chef Eric from Everybody's Cafe LIVE at GBS at 7:00 pm on Tuesday, January 3. Field Work: A Family Farm, a documentary by award-winning filmmaker John Helde, makes its Iowa broadcast debut Sunday, April 12 at 1 p.m. on Iowa Public Television. A quietly powerful journey to the heartland of America, Field Work: A Family Farm tells the story of the Swansons, Iowa family farmers who struggle to stay small in an era of mega-farms. In the last 60 years, technology and economics have reshaped America’s agricultural landscape; the quest for ever-higher yields and the flight of the younger generation has resulted in bigger and bigger farms. Shooting entirely in central Iowa, director John Helde spent several years tracking the Swanson family through the economic roller-coaster of the recession years. James Moore talks with the award-winning director about his film. The music for the soundtrack was created by Fairfield's own Dennis James and Lauryn Shapter, who also speaks with James plus debuts her and her husand Dennis James new song "A Patch of Land." 1pm: Amalie Nash, an award-winning Michigan journalist, is the new editor and vice president for audience engagement for The Des Moines Register and DesMoinesRegister.com. Nash also has coordinated the Gannett Michigan network of news sites, which includes six newspapers and one TV station. Is it Time for Educational Reform? Join host, Andrew Tint as he highlights the issues facing Generation Y. This week Andrew Tint speaks educational reform with Student'sFirst, Patty Link, followed by Governmental candidate, Jonathan Narcisse. Led by Michelle Rhee, StudentsFirst formed in 2010 in response to an increasing demand for a better education system in America. Studentsfirst is a grassroots movement designed to mobilize parents, teachers, students, administrators, and citizens throughout the country, and to channel their energy to produce meaningful results on both the local and national level. Patty Link brings broad-based education experience to her work at StudentsFirst. Patty co-owns LinkStrategies, a political strategy consulting firm, with her husband. Prior to joining StudentsFirst, Patty served as the Program Director for Super Wednesday After School Program, an after-school program for K-5 students. She has also previously served on the Board of Directors for Des Moines Independent Community Schools. Patty is a former teacher, is a member of International Reading Association, and serves as an elementary and middle school’s PTA President. She earned her bachelor’s degree in Elementary Education and Early Childhood Education from The Pennsylvania State University and a MEd degree in Curriculum and Instruction with a Reading Specialist Emphasis from George Mason University. Andrew Tint sits down with Jonathan Narcisse (D), whose running for Governor of Iowa. Mr. Narcisse made his announcement to enter the race in Cedar Rapids, and is now touring the state, which included a stop in at KRUU FM. Before putting his hat in the political ring, Mr. Narcisse served on the Des Moines School Board. Listen to Mr. Narcisse talk about the problems inflicting Iowa today, including the need for education reform, taxes, and fighting poverty. A couple of months ago, a good friend whom I rarely get to talk to posted this on Facebook: "JUST GOT MY COPY OF HER SECOND BOOK..I'M READY TO READ! anybody else???" Of course I had to check out "Wishing on Willows" by Katie Ganshert, and when I saw that she is an Iowa author who sets her books in a small Iowa town, I knew we had to get her on Writers' Voices. So Cherlyn - this one's for you! Hope you can listen in this Friday! James Moore speaks with executive director Becky Allgood of the Herbert Hoover Presidential Library & Museum, located in West Branch, Iowa, which is celebrating its 50th Anniversary this summer with a free all-day event August 4th. Great fun all day for the whole family. KRUU is a proud cosponsor of the event. For details, click here. Steve King is the U.S. Representive for Iowa's 5th congressional district, serving since 2003. He is a member of the Republican Party. King is considered an outspoken fiscal and social conservative. After winning the 2002 Republican nomination, he said that he intended to use his seat in Congress to "move the political center of gravity in Congress to the right." 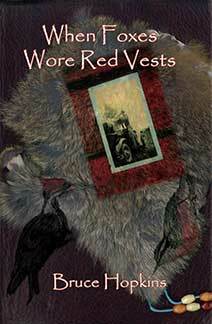 Bruce Hopkins discusses "When Foxes Wore Red Vests"
Writers' Voices welcomes environmental educator, writer and historian Dr. Bruce Hopkins to the show this week. Dr. Hopkins has written the book "When Foxes Wore Red Vests", a collection of essays, poetry, drawings and photographs that demonstrate how sense-of-place can serve as a role-model for future generations, as well as helping us learn how we can best live in our communities and with the natural world around us. Dr. Hopkins career has included teaching in Nebraska, New York, and Iowa, and serving as chief administrator of an Iowa area education agency. Bruce’s life now centers on helping people of all ages connect with nature, a greater sense of community, and the literature of place. Zachary Michael Jack on "Native Soulmate"
Seventh-generation Iowan, Zachary Michael Jack is the Writers' Voices guest this week. His book, "Native Soulmate: A Season in Search of a Love Homegrown", tells of his attempts to love fresh, love local. Travelling across the state of Iowa, giving lectures and signing books, Zachary tests his theory that the girl of his dreams may be closer than he imagines. Zachary Jack currently lives in rural Iowa. He has authored "What Cheer: A Love Story", been a sports editor and has edited many anthologies, including "Letters to a Young Iowan", "Uncle Henry Wallace: Letters to Farm Families", "Iowa: The Definitive Collection", and many more. Bob Saar: "In Memory of David's Buick"
This week's Writers' Voices features an interview with Bob Saar. His most recent novel is titled "In Memory of David's Buick". The book follows Iowa songwriter Bucky Minnow, who's song David's Buick, was ripped off by booking agent, Buddy Payola, and Dusty Bodine, who is using Bucky's song and a magic guitar to return to fame. Bucky takes off on a road trip that leads him through incredible misadventures like no other and ultimately leads him to the meaning of life. Other characters in this book include Bucky's girlfriend, Lido Wan, disc jockey Roy Lukas, Shadow guitarist Dogus, an ancient medicine man, two ethereal spirits, and a host of FBI agents The book gives a unique view of life, love, war, rock 'n' roll, Iowa, and sweater-clad Chihuahuas trapped inside hot automobiles.